Tom Levens who is from South Ronaldsay in Orkney has an unusual job. 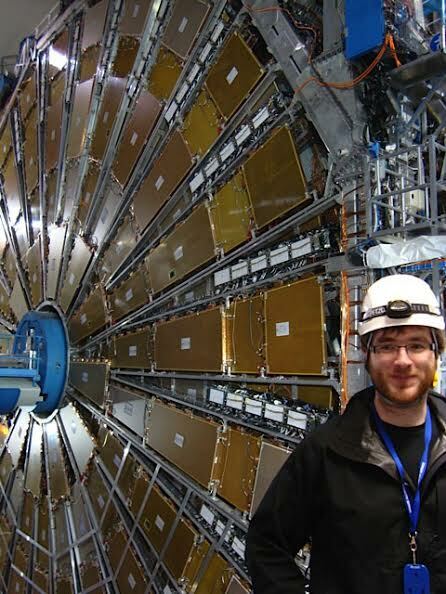 He works on the Large Hadron Collider in Switzerland helping to find such things as the Higgs Boson. Deep in the mountains lies a large doughnut-shaped accelerator, a massive hollow tube lined with magnets round which atomic particles hurl at high speed. Tom is an electronics and electrical engineer and he works in the research and development department of CERN, the European centre for nuclear research. The Large Hadron Collider (LHC) is in fact a gigantic scientific instrument near Geneva, where it spans the border between Switzerland and France about 100 metres underground. It is a particle accelerator used by physicists to study the smallest known particles – the fundamental building blocks of all things. It will revolutionise our understanding, from the minuscule world deep within atoms to the vastness of the universe. Two beams of subatomic particles called hadrons – either protons or lead ions – travel in opposite directions inside the circular accelerator, gaining energy with every lap. Physicists use the LHC to recreate the conditions just after the Big Bang, by colliding the two beams head-on at very high energy. Teams of physicists from around the world then analyse the particles created in the collisions using special detectors in a number of experiments designed for the LHC. The Hadron Collider complex consumes a great deal of electricity and there are miles of wiring and complex control systems. Tom is in his element, his father says. Even as a small child, his parents recall him playing with old electrical equipment, wiring things together such as furniture and even bushes in the garden. By ten years old he could read wiring diagrams and circuit boards, especially for guitars. Tom first went to St Margaret’s Hope School, and to Kirkwall Grammar School, then on to Glasgow University where he got an MEng degree in Electronic Engineering with Music. During the course he did a placement at CERN and then a Fellowship there. Although at CERN he has his own lab and office, his working environment includes the Collider and its control rooms. The complex is vast with some of the equipment in caverns bigger than St Magnus Cathedral. There are wires and pipes everywhere and control rooms straight out of Star Trek with technicians and scientists monitoring arrays of screens and controls. CERN is the world’s leading laboratory for particle physics. It was founded in 1951, just after World War Two, for peaceful purposes only and in a spirit of co-operation, in a still battle-scarred Europe. It has its headquarters in Geneva. At present, its member states are Austria, Belgium, Bulgaria, the Czech Republic, Denmark, Finland, France, Germany, Greece, Hungary, Italy, Netherlands, Norway, Poland, Portugal, Slovakia, Spain, Sweden, Switzerland and the United Kingdom. India, Israel, Japan, the Russian Federation, the United States of America, Turkey, the European Commission and UNESCO have observer status. CERN is supplied by RTE, the French electricity company, via a dedicated 400,000-volt line. Particle accelerators and detectors as well as infrastructure equipment need to be supplied with large amounts of electricity. Part of Tom’s work is in building the system that accelerates the beam within the Large Hadron Collider. The beam is accelerated by an electric field and then bent round the ring by magnets. The nominal annual electricity consumption reaches some 1000 gigawatt-hours (GWh) when all accelerators are in operation. Only about 8% of this figure corresponds to the basic consumption necessary for the laboratory infrastructure. The remaining 92% is attributed to accelerator facilities. The Large Hadron Collider will gradually reach its nominal consumption of 390 GWh per year. A large fraction of the LHC electrical consumption will be to keep the superconducting magnet system cool, down to the operating temperatures (1.8 and 4.2 degrees Kelvin) depending on the magnets. CERN’s annual electricity consumption is around one terawatt-hour (TWh), which roughly corresponds to a fifth of the consumption of the Canton of Geneva. However, during periods when all the machines are operating at the same time, the demand can reach the equivalent of a third of Geneva’s total consumption. In addition to the main Meyrin site, which straddles the French-Swiss border close to Geneva, CERN has several other laboratories, primarily in the Pays de Gex district of France, including the Prévessin-Moëns site (in the Department of Ain). In total, CERN sites cover over 200 hectares. While particles whizz round at high speed below ground, above on the surface are green meadows of wild flowers. These areas notably include natural flowerbeds where rare plant species have developed over a number of years. Between 1000 and 3000 plants of nineteen different species of orchid flower in these areas every year, in particular several hundred of the rare and protected species Ophrys Apifera, the bee orchid. CERN gives priority to the natural management of green areas and avoids the use of pesticides. Its sites also include several sheep pastures. The sheep contribute to the upkeep of the grounds and at the same time bring a rural touch to the immediate vicinity of the industrial buildings. As it pursues its goals of basic research, development of new technologies, education and international cooperation, CERN keeps the environment very much in mind in its building projects. A new physicists’ building currently under construction will, for example, have a green roof. A campaign to replant indigenous tree species on the site is also planned for next year. In addition, CERN has an impressive fleet of some 500 bicycles, which it lends to visitors free of charge. This is one of the largest fleets of its kind in Switzerland.